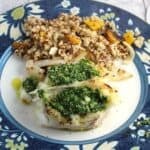 Grilled halibut topped with an easy, flavorful parsley pesto for a healthy main course. Make the parsley pesto: add the garlic to a food processor, and whir the garlic to mince. Add the parsley, pumpkin seed, olive oil, salt and pepper to the food processor. Puree to combine all the ingredients into a consistent pesto sauce. Set aside while you grill the fish. Coat the halibut with olive oil or canola spray. Place on the grill, and grill covered for 5 minutes. Flip the fish to grill covered for another 5 minutes. Check the fish after 10 minutes of total grilling time. It should be white throughout and flake apart. Finish with another couple minutes of grilling if needed. The halibut takes 10 to 12 minutes to grill, depending on your grill heat and thickness of the fish. Remove the halibut from the grill to a platter. Let the halibut rest for a couple minutes, then serve the halibut topped with the parsley pesto.